Being an intern at PeopleKeys, I learned strategies that would help with moving any company forward such as blogging, market research, the importance of SEO for web presence…and even how to properly hole-punch a client report. However, the one big thing I learned, which will stick with me for the rest of my life, is knowledge of DISC theory. The DISC assessment made me realize and notice my personality, and how I conduct myself around people. Prior to starting my internship at PeopleKeys, I took the DISC assessment and my report came back as being an IS combination. After reading my DISC profile, I thought, “How true this is!” I started to think and recall previous encounters, and I couldn’t help but notice I enjoy being with people and talking to them. I also put people first before my own personal happiness, and I love being outside and meeting new people. I have become more aware, of my own personality style strengths and weaknesses. I learned that I am not a very detail-oriented person. I am able to complete a task quickly, but might tend to overlook specifics that could be important for my managers. Just because a piece of information might not seem important for me, it can be very important to someone else in their job. Also, it’s very important to double-check your work, regardless of your personality style. However, I am creative and enjoy reaching out to people. I was tasked with creating cover photos for blog posts and was able to put graphics together quickly and easily, which my coworkers highly praised. Being aware of my weakness in overlooking detail, I am now teaching myself to focus harder and double check my work for any mistakes, or check for information that I might have overlooked. I hope to someday work with the UN and I know the strengths my high “I” personality style brings to the table will help in that position. DISC has helped me understand and recognize others’ personalities. I had thought of people in a way most people generally would in describing someone’s behavior, such as “that person is…demanding…or talkative…or shy and depends on others…or wants everything to be perfect.” After learning about DISC theory, I think differently now about those I come in contact with and this new vantage point changes my perspective greatly. For example, my friend who usually likes to be in charge of everything and wants things to be done “right now” is a “D” personality style. An “I” personality style is my friend who stands out in our group, enjoys having fun, and never takes anything serious (the “I” style LOVES to talk and is very outgoing). My go-with-the-flow friend is an “S” style. My “C” style friend is the one that asks ALL the questions -- Where are we going? How are we getting there? How long are we staying? Who’s going to be there? -- The more details the better! I’ve learned how to better communicate with each personality style, once identified by their observable behaviors. I have learned the importance of good communication in the workplace. The best way to stay on the same page with coworkers is to keep communication open. My high “I” personality style has helped me adopt this habit, especially since I enjoy talking to people anyway. It also helps to have an open-office environment that encourages open communication and where everyone can see and hear each other, instead of having to leave our desks or waiting for an email response. DISC Theory helps each person learn their communication preferences, and the preferences of each other and how a workplace can adopt good inter-communication practices. DISC theory can be used beyond the workplace too. 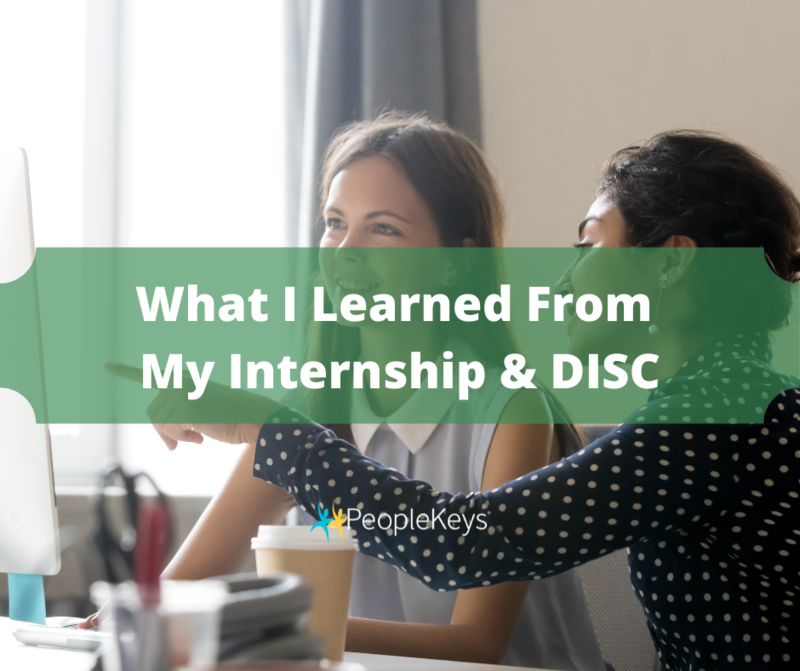 Going forward, I will continue to learn more about myself and others by applying DISC theory and what I have learned during my internship at PeopleKeys. Continuing to use behavioral analysis in my life will help me become more successful in reaching my goals, developing my personal strengths and weaknesses, building stronger relationships and better communicating with others both inside and outside the work place. If you want to discover more about yourself and how to apply DISC theory to your life, take a DISC assessment, or take a step further to become certified in behavioral analysis. It will help you apply the knowledge you gain to make dealing with people of all personality styles around you easier and give you a better understanding of why people do what they do.